I hesitate on calling this dish a vegan mac and cheese because using a label that your taste buds have already formed an opinion on can lead to dissatisfaction. However, this healthy & super tasty version will absolutely satisfy your craving for a big bowl of creamy pasta. It will scratch that itch and do it without leaving you feeling sluggish and guilt ridden. When subbing out healthy meals for traditionally known dishes, the key to success is going in with the right mind-set. Don’t expect the same exact flavors. Be opened minded, with the goal of satisfying your craving, but still feeding your body (and mind) well. Saying all that, these veggie noodles with a creamy cashew sauce sure is tasty. Try it out and let me know what you think in the comments below. 1. Allow cashews to soak in water for at least an hour. 2. In a saucepan add olive oil, garlic, and onion. Saute until onion is golden brown. 3. In a blender, add coconut milk, turmeric, cashews (drained), nutritional yeast, lemon, salt, and garlic/onion mixture, blend well. 4. 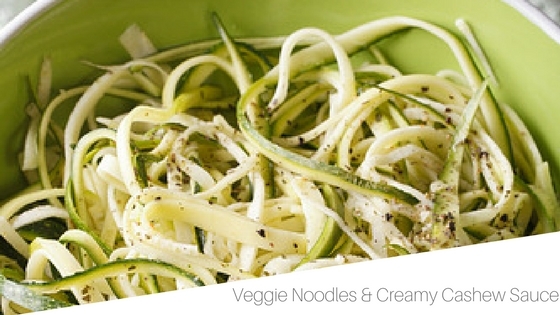 Make your zucchini noodles with a spiralizer or using a potato peeler. Chop up broccoli and mushrooms, then place all veggies in a medium sized pan over medium heat. Go wild and add any additional veggies to this dish. 5. Allow veggies to saute for about 5 minutes, then pour the desired amount of sauce over the veggies, simmer until sauce thickens and veggies cook to desired texture. Top with red pepper flakes, salt, and pepper, all to taste and ENJOY! Sauce makes around 5 servings and will keep well in the fridge. Add it over cooked broccoli, to rice noodles, or dip veggies in. Ready for a Reboot? Want a free 7-day Clean Eating meal plan? Check out our No Fee 7-Day Clean Living Challenge! plus a FULL 7-day meal plan to follow. but you seem like you realize what you’re talking about!